This Biobrick is identical with Part BBa_K2273014 apart from an added C-terminal His Tag for purification purposes. This Biobrick is a codon optimized version of Biobrick BBa_K1159201 improved for ideal production in Bacillus subtilis. It codes for an oligopeptide forming an covalent isopeptide bond with a protein called SpyCatcher BBa_K1159200. There is also an shortened and codon optimized version of this protein called the Minimal SpyCatcher BBa_K2273015. The Spytag and the Minimal SpyCatcher can be fused as a tag to proteins of interest and will then mediate covalent bonding of these proteins. The original part was used in E. coli but the SpyTag was thought to be implemented throughout TU_Dresdens project in B. subtilis. Therefore the sequence was codon adapted for this purposes. The sequence was proposed by researchersthat investigated the secretion of SpyTag/SpyCatcher system in B. subtilis. The SpyTag was submitted to the registry with an added C-terminal His-Tag to purify the protein constructs when SpyTag/SpyCatcher link together. The 2017 team of TU_Dresden used the SpyTag together with its partner mini. SpyCatcher to investigate the potential of using B. subtilis secretion system for the production of self conjugation multi protein complexes. The his-tagged SpyTag was C-terminally fused to mCherry which functions as a reporter protein. The secretion was mediated through the N-terminal signal peptide of AmyE. The secretion of the functional mCherry fusion protein could be proven (Figure 1 and Figure 2). The functionality of the SpyTagr was proven through SDS-Page (Figure 3). After incubating supernatants containing mCherry-mini. SpyCatcher and mCherry-SpyTag the fusion product was detected, proving the covalent bonding of the Tag partners. Figure 1: Endpoint measurement of the fluorescence from supernatants. Expression of the multi copy mCherry constructs (purple) was induced with 1% Xylose and the supernatants were harvested after 16 h of incubation. Wild type supernatant is shown as a control (pink). Excitation wavelength was set to 585 nm and emission was recorded at 615 nm. The fluorecense was normalized over the optical density of the cell culture at 600 nm (OD600). 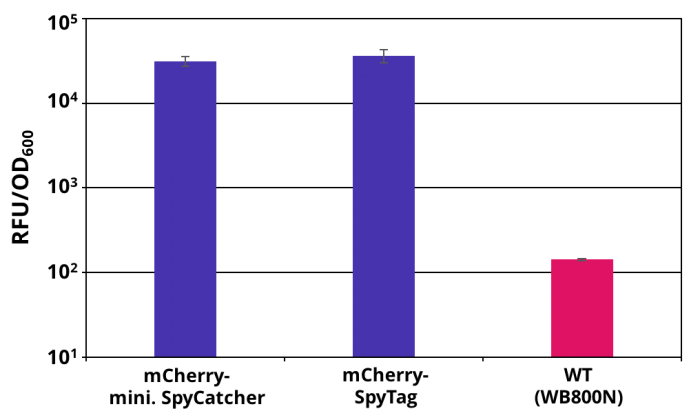 Graph shows mean values and standard deviations of at least two biological and three technical replicates. Figure 2:Supernatants of B. subtilis cultures. Wild-type supernatant (left) and a mCherry-mini. SpyCatcher secreting strain (right). 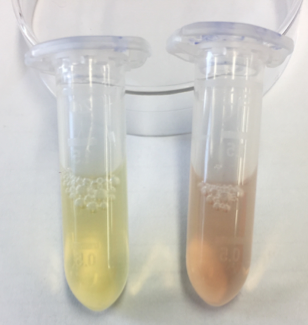 The expression of the multi-copy mCherry was induced with 1% Xylose and the supernatant was harvested after 16 h of incubation. Figure 3: SDS gel with crude and purified supernatants. Expression of the multi copy mCherry constructs was induced with 1% Xylose and the supernatants were harvested after 16 h of incubation. 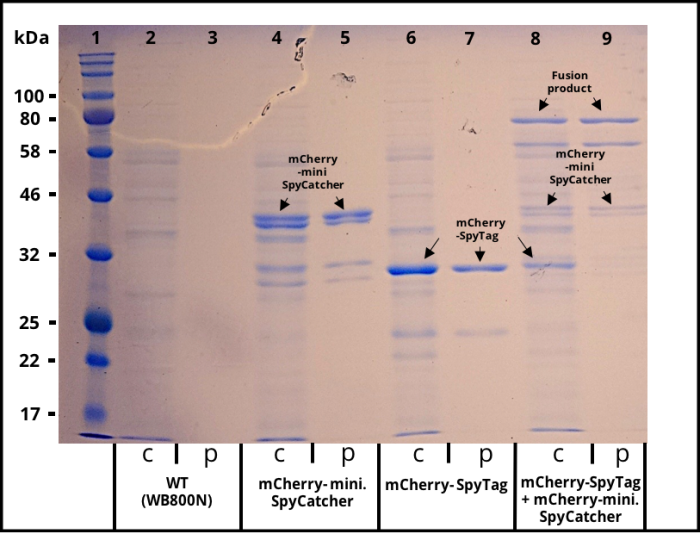 The his-tagged proteins were purified with Ni-NTA agarose beads. Lane 1 was loaded with 3 µl of NEB´s “Color Prestained Protein Standard Broad Range” ladder. Crude (c) and purified (p) supernatant of wild-type (WT) are shown as a control in lane 2 and 3. Lane 4 and 5 contain the supernatant of B. subtilis producing mCherry-mini. SpyCatcher fusion protein (36,6 kDa). Lane 4 and 5 contain the supernatant of B. subtilis producing mCherry-SpyTag fusion protein (31,9 kDa). The crude supernatants of the two mCherry producing strains were combined, incubated for 4 h, purified and loaded onto lane 8 and 9. The fusion product of the mCherry constructs is visable in the crude and purified supernatant.